Kneading bread dough is one of those things that is best taught in person. Unfortunately, most of you don’t live near me, and so I can’t offer a one-on-one kneading session! (If you do know someone who bakes, I’d highly recommend hitting up her/him for a kneading lesson). Proper bread kneading stretches the proteins in the flour (called gluten). The stretchy dough holds the air bubbles the yeast makes as it ferments, and this causes the dough to rise. If the gluten is not properly developed, the dough will not be strong enough to hold the air bubbles, and the bread will not rise properly. Probably the most common mistake people make when kneading bread dough is that of adding too much flour. If the dough is too stiff and heavy, the air bubbles will not be able to lift it. So, you want to have a stretchy, somewhat soft dough when you’re done kneading. However, you also don’t want to have the dough sticking to the counter. Thus, it’s best to only sprinkle flour on your kneading surface, and not on the dough itself. 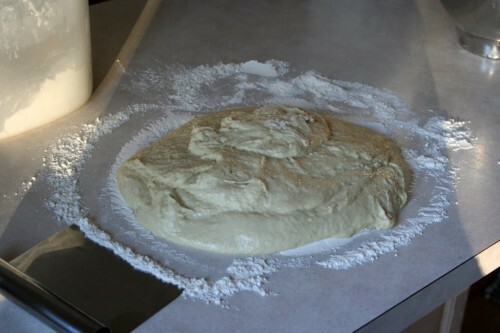 The idea is to keep a floured, dry surface on your dough and to keep the inside moist. 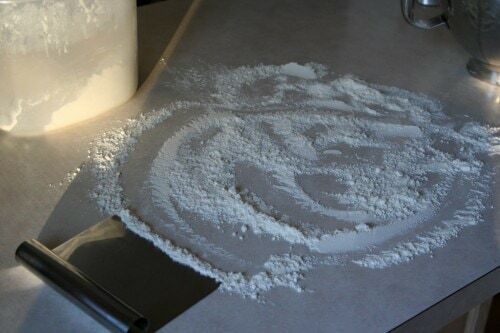 Before you turn your dough out on to the counter to knead it, you’ll want to spread some flour over your kneading surface, like so. Turn your bread dough onto the floured surface. 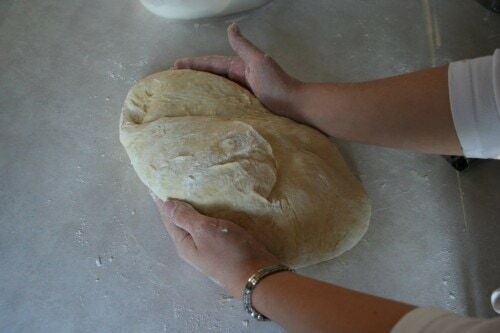 If this is your first time kneading, you might want to make your dough a little stiffer than this before you try to knead it. I’m not sure why I left it so soft on this particular day! I like to use a bench knife(the stainless steel tool you see in these pictures) to help with the early stages of kneading. 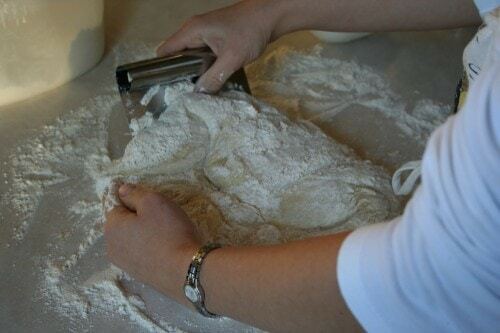 At first when I knead, I use the bench knife to sort of fold the outsides of the dough towards the middle. I do this, adding flour as necessary, until the dough looks like this. Then I switch to using just my floured hands. My basic kneading pattern is to fold the dough in half, push it with the heels of my hands, give it a quarter turn, and repeat the process. Here I’m getting ready to fold it. I don’t fold it all the way over, as you can see. Then the process starts all over again. Depending on how much you mixed the dough before kneading it, this process can take anywhere from 5-10 minutes. 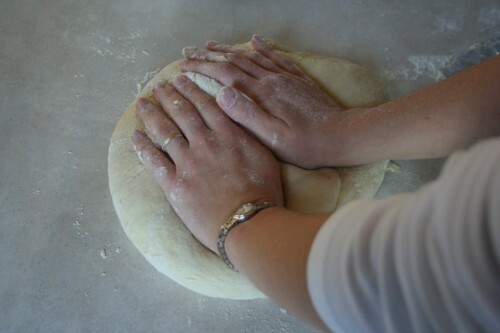 To check if your dough is sufficiently kneaded, give it a quick poke with your finger. If it bounces back, you’re done. If it’s really slow to bounce back, or the hole doesn’t fill in at all, you need to knead some more. 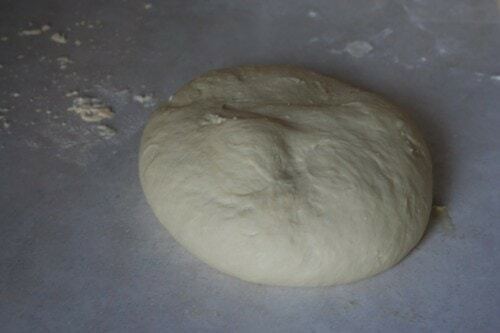 Most bread doughs should look something like this when you’re done kneading. Of course, this is not the only way to knead bread…other bakers have different methods, and if you’ve found a method that works well for you, you need not feel any pressure to switch to my method. 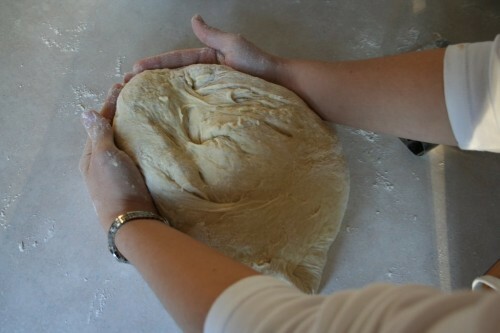 The important thing is that the dough gets pushed and stretched so that the gluten develops. I’ll post an easy bread recipe next week so you can practice your new kneading skills. Should you decide to try before then, though, I’d just encourage you to not give up if your first attempt at kneading is awkward and messy…it takes some practice to develop a good kneading rhythm, and you won’t get good at it if you give up too soon. And of course, you can feel free to email me or leave a comment if you have a question or run into a problem. 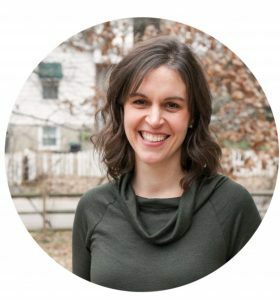 « A negative post, in which I whine about being cold. 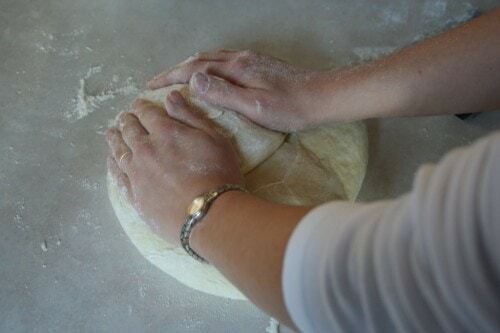 I love kneading dough. It is very satisfying to turn a sticky bowl of dough into a smooth fluffy ball. I cheat. I let the bread maker do the kneading, although baking the bread in the oven works better than baking it in the bread maker. I’m new at baking bread. Would you consider doing a post on how the different flours (all purpose, unbleached, bread flour, whole wheat) affects your final product? I thought that’s what my dough hook on the Kitchenaid was for. I occasionally will knead my own dough but lately I’ve just let the machine do it for me. By the way, this weekend I’m thinking of trying out your hamburger roll recipe. I figure it should be fun. Emily! Good to see you. Cheryl, yes, I will try to do that. Battra, I never use my dough hook. I’m so used to doing it by hand, it’s easier for me to mix the dough in the mixer and then just knead it myself. I hope your hamburger buns are delicious! Thank you. This was a big help for me. I’ve always loved making bread, but struggle with the kneading and rising part (I live in Oregon and so I double the yeast to account for the weather, which usually works). Cheers! I use the bread machine Kristen, my rcipe seems to produce an excellent loaf at least 9 times out of 10. The time saved makes it worth while to me. 1. 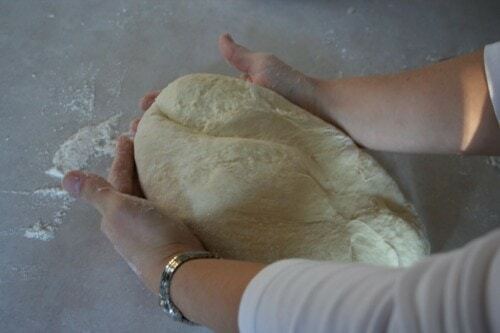 What surface do you knead your dough on? Is it your actual counter or something you place on top of the counter? If it’s your actual counter, how do you clean it first before placing the flour/ dough? Just soap and water or some cleaner product? 2. On other bread recipes, you mention placing a damp tea towel over the bread to rise. Do you mean literally on top? ?…laying it directly on top of the dough where it’s touching? Or do you mean to place the dough in a bowl to rise and cover it with a damp tea towel? Is a damp tea towel the size of a wash cloth towel or hand towel? Would a damp handkerchief work also? Ok, so 2 main questions with sub-questions, LOL. I’m very into the details, can you tell :). Thanks again for all your helpful thoughts! Can’t wait to try your recipes, yum yum. 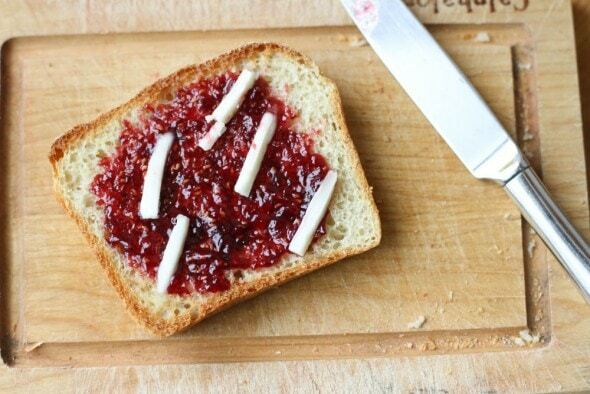 Jen ~ I would just use soap and water on a counter top, I wouldn’t want any bad chemicals getting into the bread. A tea towel is like a kitchen towel. It’s also called a flour sack towel. It’s a smooth cotton that’s don’t have bumps. You would also have it touching your bread dough. You want it touching to keep your dough from drying out and forming a crust on your dough. I use plastic wrap over my dough then a flour sack towel on top of that. I always have issues with my dough sticking to the towel on its own. And you want to loosely tuck It down the sides of your dough but not under it. Then you can watch your dough grow and lift the towel. I love your step by step kneading process. your pictures on how to knead dough went a long way in explaning the word ‘quarter turn’ which was causing some problem for me. Please explaing this word further. I just came to get a little refresher on kneading – I watched your slideshow a few years ago and found it super helpful. BUT … it seems to be missing! (Which makes sense, since I know this post is three years old.) Can you please re-post the slideshow somewhere, or have Mr. FG or Joshua help you with a video? Pretty please? Usually doughy bread is a result of too much flour, and not because of failed yeast. 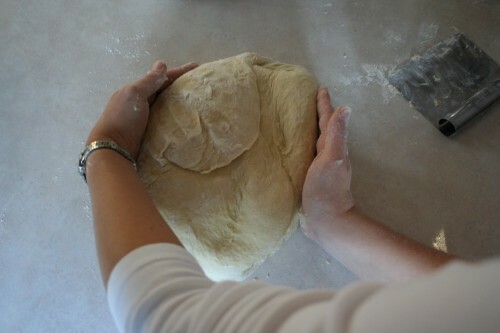 Bread dough should be fairly soft and flexible, not stiff, as soft dough rises much better. I used Red Star yeast, which I buy in a large package from Costco. This helped a lot. I did a little baking on my own in the past as my mom wasn’t much of a baker, and well kinda gave it up for a few years while I was too busy, but I decided a two hour bun recipe today and am using your technique. Thank you for the insight. Feel free to send me baking tips.